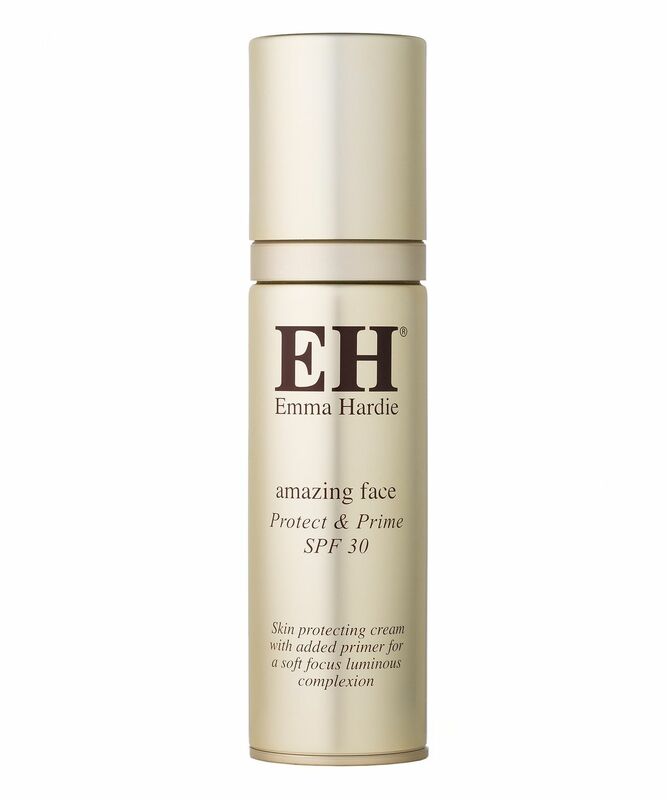 A dual-action protective primer, this lightweight formula stars light-diffusing particles to blur the visibility of imperfections and unify uneven skin tone, whilst warding against the harmful effects of UV rays with SPF 30. Completely non-greasy and totally undetectable (there’s no chalky film), this creates a perfect base for make up and enriches skin with a cocktail of conditioning nutrients. Mongongo oil, oat extract and vitamin E combine to fortify skin’s fabric – enhancing elasticity and bolstering its natural defences – to leave your complexion smooth, supple and safe from the ravages wrought by the elements. Suitable for all skin types, this creates a beautiful, soft focus effect and lasts for up to eight hours. In 1996 Emma Hardie introduced her unique Natural Lift and Sculpting facial, which set the beauty industry a-buzz with praise for its miraculous ability to firm, plump and enhance skin’s resilience. Emma’s passion stemmed from her own experience – and she was inspired to create Emma Hardie Skincare – a capsule collection of multi-purpose products, developed for use with prescribed application techniques so the woman at home could indulge in an everyday facial. Moringa seed is at the heart of Emma’s range – a renowned tissue-strengthener and potent source of skin-essential vitamins, minerals and antioxidant-rich phytonutrients which help to rehabilitate dulled skin and quickly recover its youthful vitality. Apply daily on cleansed skin. Can be used alone or on top of your usual skin care cream for added protection and hydration. Can also be worn under makeup as a primer. Warnings: Contains Oxybenzone – Avoid contact with eyes, and rinse thoroughly if in contact with warm water. EH Expert tip: Apply daily under makeup for a long lasting soft focus effect. Aqua (Water), Octocrylene, Ethylhexyl Methoxycinnamate, Caprylic/Capric Triglyceride, Benzophenone-3, Acacia Decurrens/Jojoba/Sunflower Seed Cera/Polyglyceryl-3 Esters, Butyl Methoxydibenzoylmethane, HDI/trimethylol Hexyllactone Crosspolymer, Tapioca Starch, Schinziophyton Rautanenii Kernel Oil, Butyrospermum Parkii (Shea) Butter, Stearic Acid, Glycerin, Butylene Glycol, Glyceryl Stearate SE, Phenoxyethanol, Benzyl Alcohol, Sodium Stearoyl Glutamate, Tocopheryl Acetate, Parfum (Fragrance), Polyhydroxystearic Acid, Geraniol, Limonene, Citronellol, Xanthan Gum, Linalool, Alumina, Aluminum Stearate, Disodium EDTA, Ethylhexylglycerin, Dehydroacetic Acid, Silica, Sodium Stearate, Polymethylsilsesquioxane, Disodium Rutinyl Disulfate, Hordeum Distichon (Barley) Extract, Melissa Officinalis Leaf Extract, Sodium Benzoate, Citral, Citric Acid, Farnesol, CI 77891 (Titanium Dioxide). I'm on my second bottle, and use this after cleansing, eye cream, serum and as my final moisturiser/primer/spf all in one, before make up as suggested. I have normal/dry skin, and it alone isn't enough as a moisturiser, I would suggest using a serum underneath. It stops my make up from caking around dry patches by the end of the day (which happens without a serum), of which I love and I don't feel the need for another moisturiser after serum or before putting this on. Worth the purchase! I received this as a free sample in my last order and it's gorgeous. I wish it wasn't so expensive! Made my makeup look amazing. This is great if you have normal skin and very busy mornings. I have combination skin and I found the best way to use it was right after cleansing, effectively replacing my serum, moisturizer, and SPF. It gave a nice glow and was super hydrating. However, it didn't help my makeup last longer, and it did kind of make me greasier than usual. But I'm sure if you had more normal to dry skin it would be perfect. I liked the smell and texture (hence 2 stars rather than one). Alas, one use of this primer and my skin broke out in loads of whiteheads and became very red. Although I have sensitive skin, I've never had this reaction to a product before. Expensive mistake on my part. I like this product - not too heavy, smell not offensive but it wasn't as moisturizing as I expected a primer to be, but then again I have dry skin so it may be more suited to normal-combination skin types. I used this cream as my primer and I really enjoyed it, plus it has SPF 30. Cream itself has a good scent and really light in consistency, as well as nourishes and protects your skin. It is a win win win win product all way around.